Instant Pot Low Country Shrimp Boil is a fun and super easy meal to make! 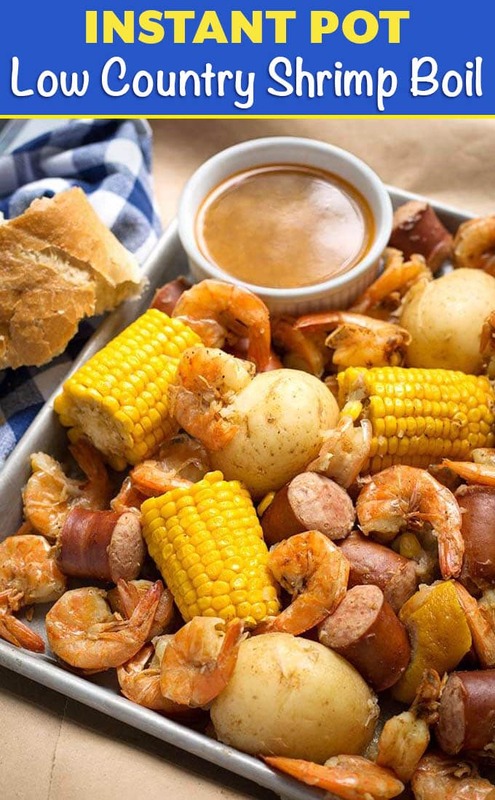 Potatoes, sausage, corn and shrimp cooked together with seafood seasoning and Cajun spices. Pressure cooker low country shrimp boil is ready in a little over an hour total! Dump it on the table and dig in! 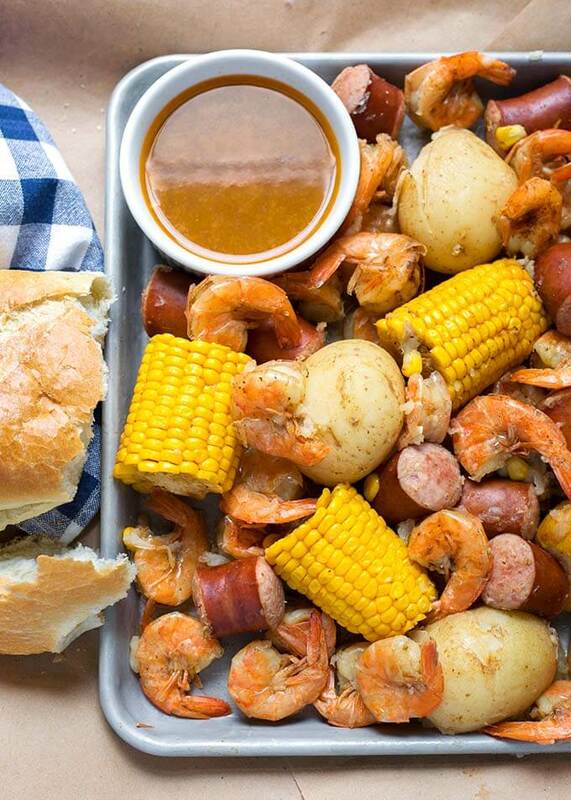 We love going to the restaurants that dump the shrimp boil on the table, hand you a bib and a mallet and leave you to just dive in! We have a friend who is a caterer and makes an amazing crawfish boil, and he inspired me to make my own recipe. So I did! Of course, I also wanted to see how this worked in my pressure cooker. Instant Pot Low Country Shrimp Boil ended up being way easier, and way faster than I thought it would be. That was amazing! So we eat this when we have company out on the back deck, or for birthday parties, and sometimes just because! 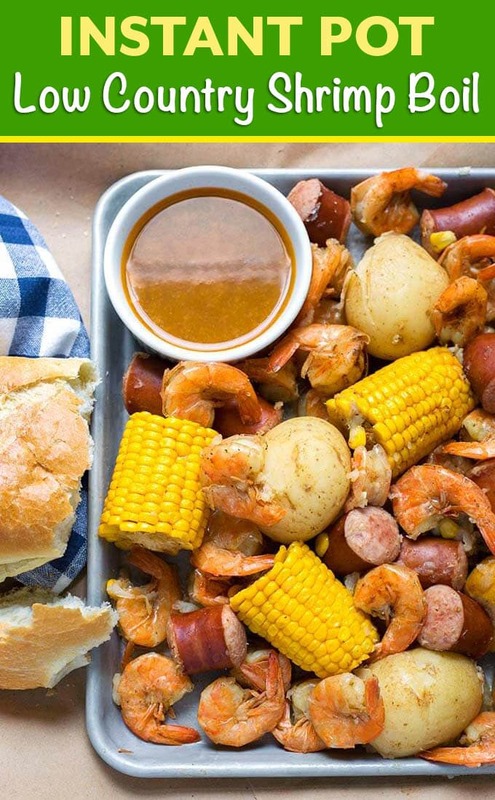 Kids really like this Instant Pot Low Country Shrimp Boil. They get to eat with their hands, and you can include sausage that is not spicy for them. I like using kielbasa. If you do like a spicy sausage, Andouille is so good in this recipe! Instant Pot Low Country Shrimp Boil is a fun and super easy meal to make! 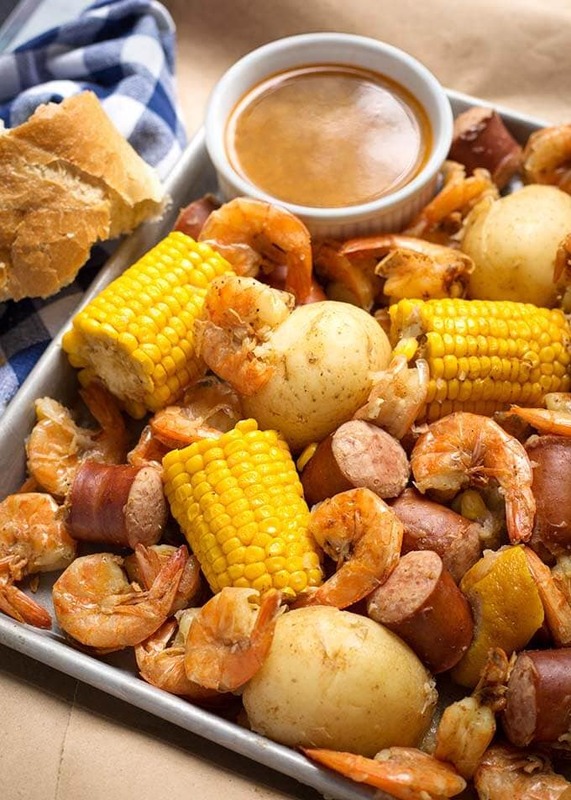 Potatoes, sausage, corn and shrimp cooked together with seafood seasoning and Cajun spices. Dump it on the table and dig in! Have all of your potatoes, corn, sausage, onion, garlic & lemon chopped or cut before you start cooking. Also have the spices there with you as it will make this go faster/easier, and everything will cook at the proper times. 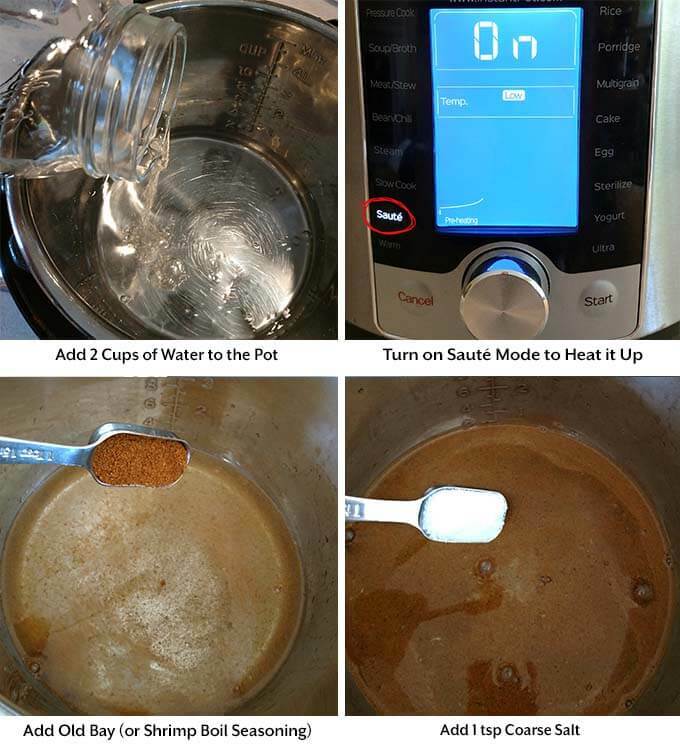 Add 2 cups of water to the pressure cooker and turn on the Sauté setting to get the water warming up. Add the Old Bay seasoning (or shrimp boil seasoning), and salt. Add Potatoes, onion, garlic, bay leaves, and lemon. Then sprinkle with some of the Cajun seasoning. Add the Corn and sprinkle it with a little more of the Cajun seasoning. 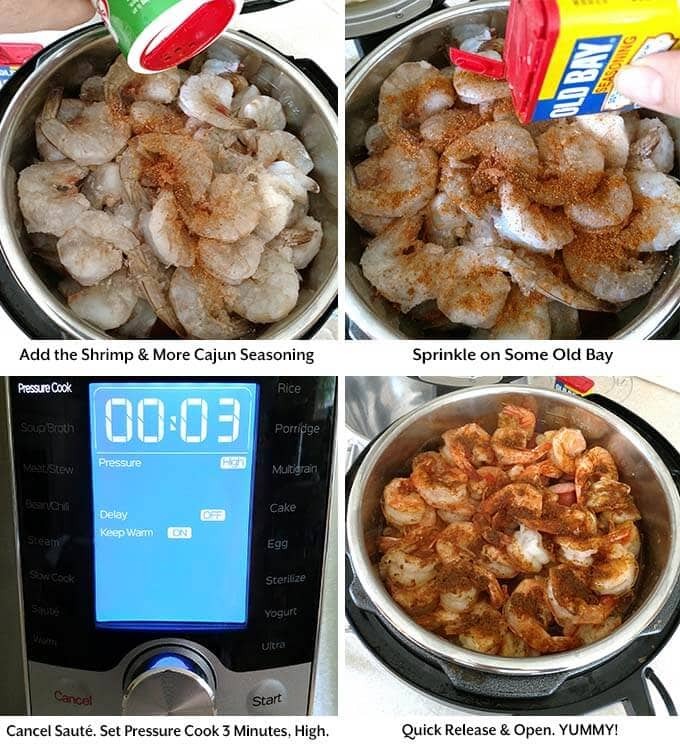 Add the shrimp and sprinkle with more Cajun Seasoning and some of the Old Bay seasoning. Close the lid and set the steam release knob to the Sealing position, Then cancel the Sauté setting. Press the Pressure Cook/Manual button or dial and then the + or - button or dial to select 3 minutes. It will take several minutes to come up to pressure. When the cook cycle is finished, turn the steam release knob to the Venting position and do a Quick Release of the steam/pressure. This will take a few minutes as the pot is full. Open the lid once the pin has dropped down. Turn off the pot. Use a spider skimmer or large slotted spoon to scoop the shrimp boil contents to a large bowl. At this point you can dump it onto a table lined with newspaper or butcher paper, or put it on a baking sheet pan and serve it from there. Melt some butter for dipping, and serve with some crusty bread. TIP: If you keep the shells on the shrimp, and keep them partially frozen, they will not be overcooked. We loved this recipe! I had never had a shrimp boil before so didn’t know what to expect. It was so delicious! My family had so much fun eating with our hands, and the kids laughed when I dumped it out on to the table. We will be having this with company next time. Thank you for sharing this great recipe! Hi Cherish (I love your name! 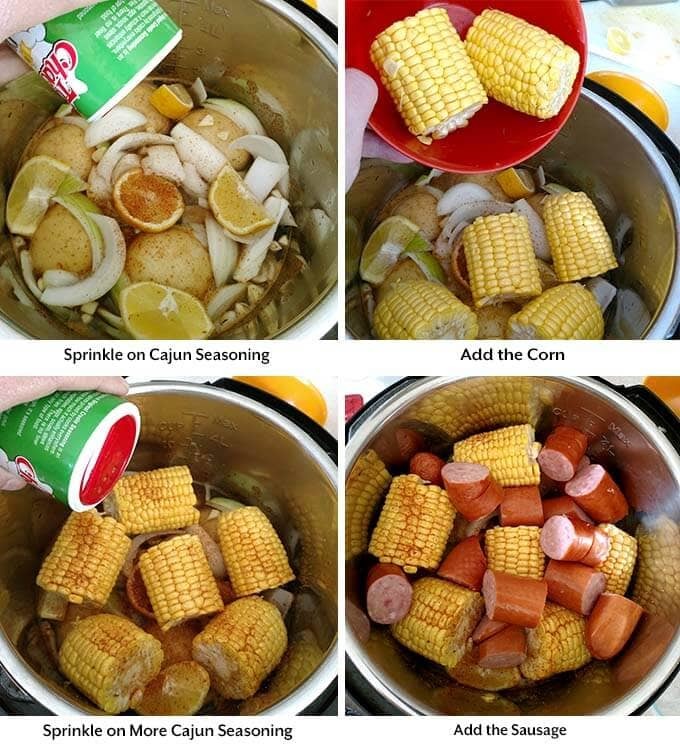 ), I’m so glad you liked this shrimp boil recipe! I am going to make it for my kids when they come to visit! Thanks for your review! Wow! So delicious and really easy! 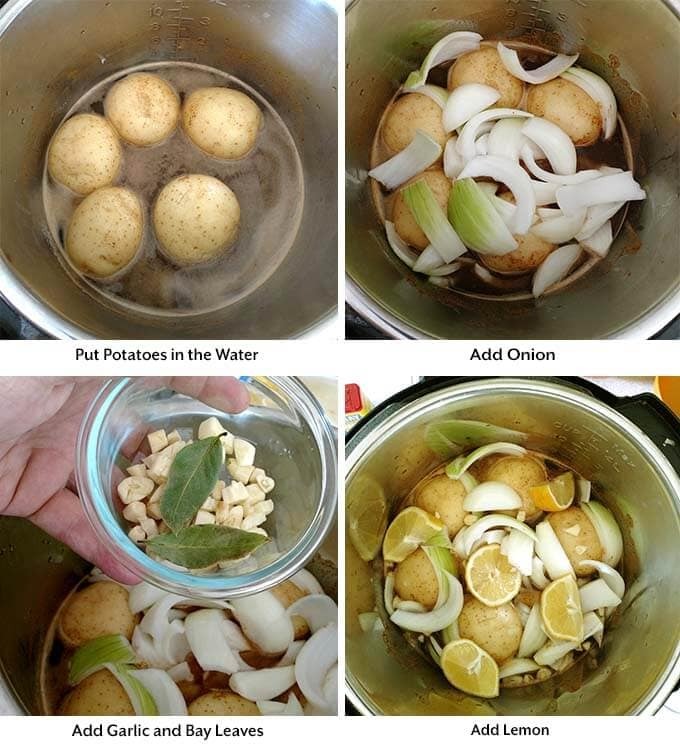 Nice adaptation for the instant pot. Thanks Kathy! I’m glad you liked it! It’s so nice to have something so easy and tasty! I’m making it for dinner tonight. I know we’ll love it and am so happy to have an easy IP recipe. Thanks. Hi Megan, I’m glad you liked this recipe! I think I also use the 21-50 count shrimp. Always with the shells. You might try cutting 1 minute off of the cook time and see if that helps. Of course, larger shrimp are a great solution as well! Yum! Thank you for your review! Just wondering what size IP is good for this recipe? I don’t see that mentioned anywhere. Thanks! Use a 6 quart or an 8 quart. Hi Jan, I would layer the ingredients in a bit pot, except for the shrimp. Cook until the potatoes are done, then turn off the heat and add the shrimp on top and close the lid and let them steam until done. OMG. The best ever. Wow. Thank you so much for this easy to follow, but phenomenally great recipe! I think we went heavy on the Cajun seasoning since we love spicy and heat. This turned an average Tuesday into something very special. Thank you!! Hi Karen! Yay! 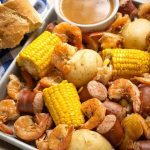 I’m so happy to hear how much you liked this shrimp boil! No more boring Tuesdays! One more question…I am making the Shrimp Boil this weekend for guests. My hubby bought Red Argentinian Shrimp even though I told him not to. They are not the Trader Joes RAS, and are much larger. The reason I said not to buy the RAS was because they cook so much faster than regular shrimp. So the question…since these shrimp are LARGE (16-20 per pound), and if I keep them frozen til I put them in the pot, can I keep the time at 3 minutes without worrying about them getting mushy? Thanks so much!! Yes, if they are large, this time will work. I use the 21-25 and they are perfect for me. If yours are not completely cooked, just put the lid back on (on Venting) and lit it sit a couple minutes and check it again. Thanks, Sandy! Really looking forward to it. For the dipping sauce: is it butter or the juice from the IP? Hi Anne, it’s the juice, or “pot likker” from the IP. You can also use butter, which is great on the corn! We made this tonight since I had 2 lbs of wild caught gulf shrimp and shrimp boil concentrate begging to be used. We followed this recipe to a T. It was AMAZING. I am from Lousiana, so I’m hard to please with shrimp boils. It did take a good 20min to come to pressure, but it was well worth the wait. Thank you, Katie! That’s quite a compliment from a Louisiana girl! This recipe was an instant success in our house. Delicious. I have shared it with my friends and family. Thank you. That’s awesome, Windy! Thank you for your review! I’m wandering if I could a peeled and deveined shrimp for this. Or do you have to use a shelled shrimp. It’s all about the cook time. The size of the shrimp, and having the shell on, as well as being partially frozen, helps slow down the cook time so they don’t overcook. I would say if they are large, and frozen, you stand a better chance when they are already peeled.